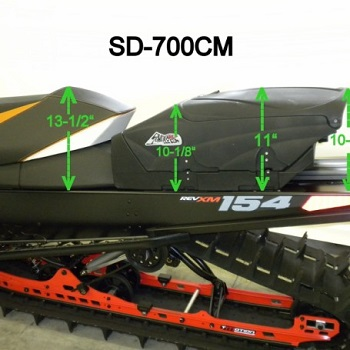 NEW POWDERKEG LLC SD-700-CM Low profile combo fits 2008 and up 137" XP, XS, XM and the NEW REV GEN 4 Chassis. It has 1800 cu. inches (29.7 liters) of dry storage and 3.25 Gallons of fuel storage. These can be used separately on your sled also and feature bulletproof latches and all the boxes are built super strong with a rotational molding process.